Motorcycles can be incredibly fun to own and ride, especially through the scenic Nevada desert or along the Vegas strip. There is something that is liberating about being on a motorcycle, and it is no wonder that so many people love to ride them. But riding a motorcycle can be incredibly dangerous if you are involved in an accident with another vehicle. Motorcyclists tend not to fare very well when involved in accidents with other vehicles. This is because the other vehicle involved in the accident is often so much larger and carries significantly more force behind it upon impact during an accident with a motorcycle. Additionally, there is little to protect motorcycle riders during an impact. Motorcycles do not have walls or a heavy frame to protect riders. They also do not have seat belts or airbags. Spine, neck, and back injuries. Severe road rash injuries from impact with asphalt. Since motorcyclists are such vulnerable drivers on the road, Nevada law aims to try and protect motorcyclists who share the roadways with other, larger vehicles. Below are a few legal duties that are owed by drivers to motorcyclists. Motorcyclists are entitled to the full use of a traffic lane, and drivers are not permitted to engage in conduct that would deprive the motorcyclist of his or her full use of the traffic lane that is being occupied. Motorcyclists have the same rights and responsibilities as cars and other motor vehicles that operate on the roadways. Effectively, drivers of other vehicles have the legal duty to treat motorcycles the same as they would treat another car that is sharing the roadway. Drivers need to give motorcyclists an adequate amount of space to maneuver their bikes, i.e., drivers of motor vehicles may not tailgate a motorcycle or crowd a motorcycle in a lane of traffic. Granted, motorcyclists also have a number of laws that they must comply with in order to bolster their own safety. For instance, motorcyclists in Nevada are required by law to wear a helmet and are also required to wear eye protection while riding. If the motorcycle is equipped with a windscreen then eye protection is not necessary. Motorcycle passengers must have a seat, a footrest, and a helmet. Motorcycle accidents are no fun, and motorcyclists often suffer substantially more serious injuries than their counterparts during an accident. If you have been injured due to the negligence or recklessness of another driver in a motorcycle accident, you need to get into touch with an experienced Nevada personal injury lawyer. 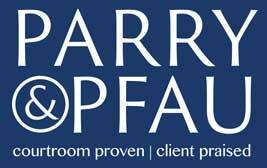 The team at Parry & Pfau is here to help you. Please contact us for a free initial consultation about your situation. Simply put, someone can be charged and convicted of a DUI in Nevada if he or she has a BAC over the legal limit or is actually impaired from drugs or alcohol while behind the wheel. One downside to the city is that it can be overcrowded and sometimes dangerous to pedestrians. When you are involved in a Las Vegas car accident, it can be difficult to think clearly right after the collision. While many believe whiplash is only a result of high-speed and serious car accidents, the injury is actually pretty common in low-speed and low-intensity crashes, as well. While avoiding an accident may seem almost impossible because of the sheer number of motorists on the roads in Las Vegas and the rest of Nevada, there are some steps you can take to ensure your safety. Newer PostIs it Legal for Motorcycles to Drive Between Cars?